The best industrial cleaning equipment suppliers not only provide the best quality products, they also offer preventative maintenance and repairs. Without professional maintenance, these pieces of heavy equipment can be extremely dangerous to operate and will not perform to their full potential. Here are some of the benefits of having your equipment professionally serviced, and a few of the reasons you should never attempt to fix them on your own. Operator and Plant Safety: There are 5.5 workplace injuries on record for every warehouse worker employed in 2011. Having untrained personnel perform routine maintenance is a huge cause of workplace accidents and injury. It’s best for everyone if you leave the industrial scrubber repairs to the professionals. Efficiency: Even if your staff is trained to fix this equipment, it is not their job. Professional maintenance workers have specific strategies and tools to fix broken or stressed equipment that makes the job much easier. Short Term Cost Savings: The short-term costs of having your equipment repaired far outweigh the alternative. While these costs may be a nuisance, the other option is to have to equipment deteriorate until it is no longer usable. 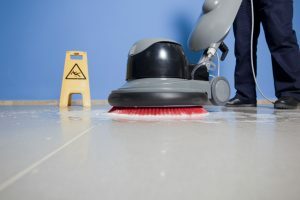 Long Term Cost Savings: If you use commercial floor scrubbers and floor sweepers for your job, you need to have the equipment properly cared for in order to perform your job thoroughly. Having ineffective equipment directly relates to the quality of your work, which affects business. Without properly functioning scrubbers, you may not have a job to do at all. But you don’t have to be a cleaning service for an equipment problem to take a toll on your business. When you meet with clients, your office has to make a good first impression. If it doesn’t, then you may sacrifice a potential sale. Cleanliness is an important part of every work environment. Time Savings: Again, the professionals can take care of maintenance much faster than you or your staff can. The turnaround for scrubber repair is pretty quick if you take action right away. But instead of relying on just any third party maintenance company, call System Clean Inc. The System Clean Inc. Preventative Maintenance Program helps you take care of problems that might arise before they even happen. For details about our flat-rate, no contract preventative maintenance program, Contact us today.